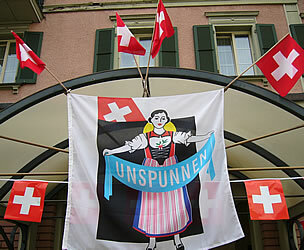 The Unspunnen is a celebration of Swiss folklore which takes place approximately once every 12 years in the town of Interlaken. 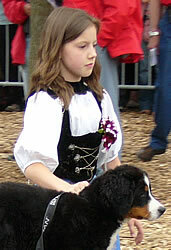 Most of the photos below were taken at the event in September 2006. 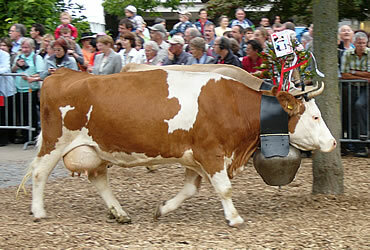 The origins of this tradition go back to an Alpine Cowherds' Festival in 1805. 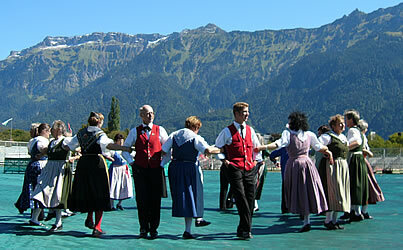 This first festival was organised as an attempt to unite the City of Bern and the people from the mountainous area known as the Bernese Oberland. 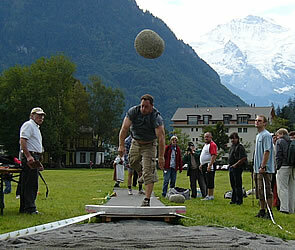 One of the most famous traditions at the Unspunnen festival is the stone-throwing (Steinstossen) competition. 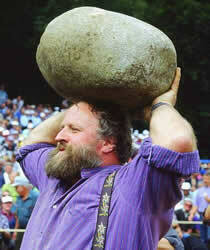 The stone used for the main contest weighs 167lb and must be thrown as far as possible. 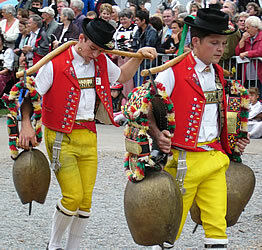 In Alpine wrestling (Schwingen) the contestants wear special shorts over their trousers. One hand grips the opponent's belt (through a hole at the back) and the other grips the bottom of his shorts. The aim is to throw the opponent onto his back (with both shoulders touching the ground), without losing the grip on his shorts. Each bout lasts up to about 10 minutes. If neither succeeds during this time it is a draw. 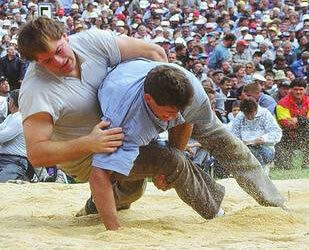 The National Wrestling Festival takes place every 3 years. 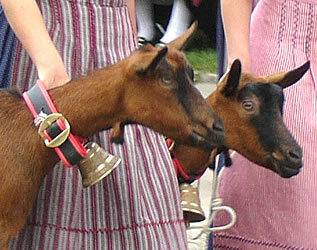 Herdsmen wear blue shirts and other competitors wear white. 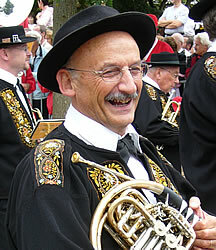 Yodelling is a traditional form of singing. 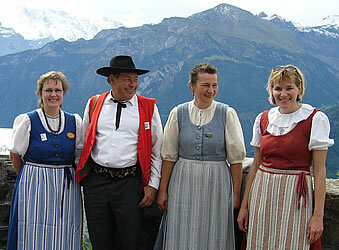 There are yodel songs, often about the mountains and local life, or melodies sung without words. 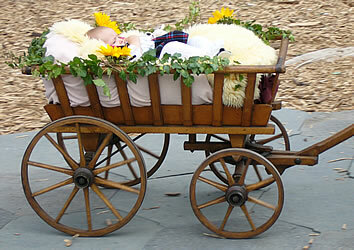 The word "yodel" is derived from an old German word meaning to cry out with joy. 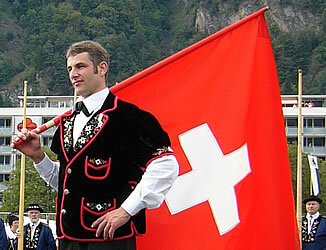 There are yodel competitions in the Swiss regions and cantons each year, and a national competition every three years. 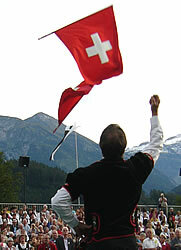 Flag throwing (Fahnenschwingen) is often part of Swiss celebrations, including those on the Swiss National Day on 1st August. 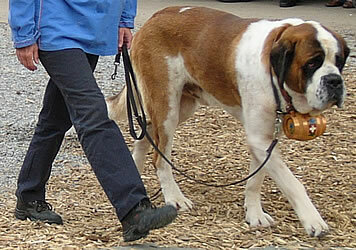 A lot of concentration and skill is required to swing, throw and catch the flags. 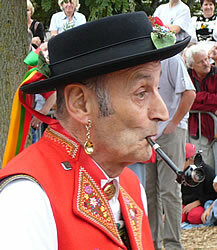 Alphorns are wooden musical instruments which are more than 3 metres (10 feet) long. 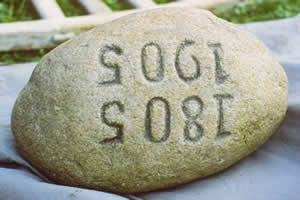 They were originally used to send signals across the mountains and to call cattle. 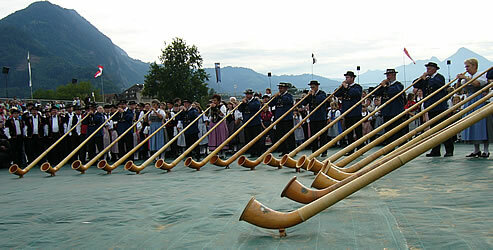 The Alphorn is the national instrument of Switzerland. 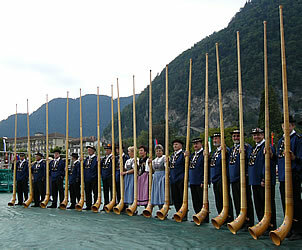 Groups of Alphorn players come to Interlaken for the Unspunnen festival, playing on the streets and in the main arena. 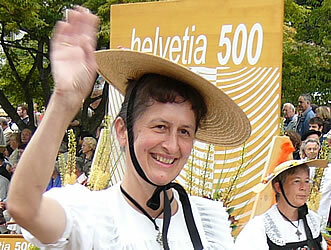 Traditional costumes were reintroduced in Switzerland during the 1920s, inspired by the drawings of Swiss artists, and a National Day for Traditional Costumes (Trachtentag) was introduced. 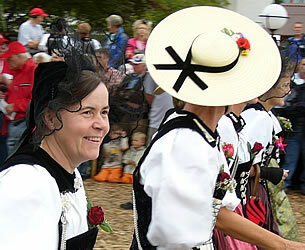 There are now many local groups who dress up and perform songs and folk dances. 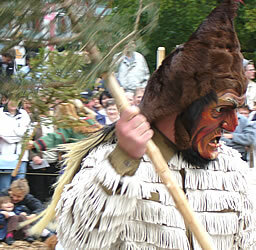 Every three years there is a Federal Traditional Costume Festival. 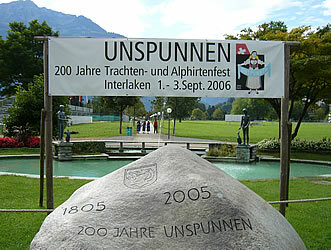 On the final day of the Urspunnen Festival there is a grand procession through the streets of Interlaken, ending at the green in the centre known as Höhematte. 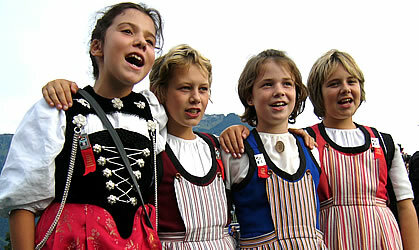 Groups from all of the different cantons of Switzerland take part, portraying the traditions and characteristics of their regions. 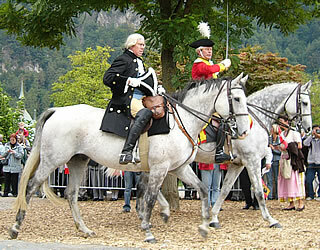 To travel by train to Interlaken Ost takes about 2 hours from Zurich, or 3 hours from Geneva.